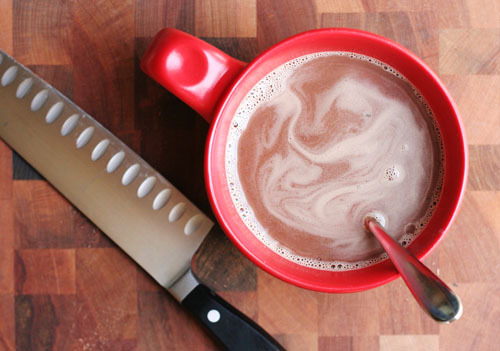 I used to be obsessed with the Williams-Sonoma hot chocolate. Not out-of-control obsessed, but I’ve spent a few pennies on the stuff. It’s basically a tin of chocolate shavings you melt in milk. Whenever I drink it, I think of the description of the thick, creamy hot chocolate served in the book Chocolat. Last year a fantastic recipe for homemade Vanilla Hot Chocolate mix came into my life (thanks, Mindy, for introducing us to the recipe!). I made it for all our friends. The jars were adorable and the mix was mighty fine. I like this mix because it has chocolate shavings, which makes the hot chocolate creamy and smooth. But there is some cocoa in there, which I think “darkens” the chocolate flavor. Oh, and vanilla sugar thrown in the mix? Yum. This year I’ve made a discovery that I’m surprised I haven’t made before. The other day I was needing delectable hot chocolate. I didn’t have any Williams-Sonoma tins lying around. And I haven’t made the Vanilla Hot Chocolate mix in over a year. That stuff is long gone. But I did have a big hunk of high-quality bittersweet chocolate in the cupboard. I put some milk on the stove. I got out my knife. I finely chopped several tablespoons of the chocolate and tossed it in the hot milk, along with a spoon or so of sugar. I whisked. I drank. And I found the delectable hot chocolate I was looking for. Really, it’s that easy? And I never thought of doing this before now? Move over Williams-Sonoma, there’s a new sheriff in town. Sometimes the best recipes are born out of desperation! I just use ghirardelli chocolate chips and milk. Then you dont have to chop anything. I also like whipped cream on top if I have it. I’ve definitely heard that before (that chocolate chips don’t melt the same as a block of chopped chocolate). I have a hunk of Callebaut in my pantry…time to make some hot chocolate! Put the chocolate chips in the bottom of the cup. Pour in a touch of milk (whole is, of course, best for hot chocolate) so that you can see a little white but hardly any through the chocolate chips. Heat in the microwave until hot. Stir furiously until it’s a melted chocolate heaven/paste. Add a touch of milk and stir. Repeat until them temperature evens out a little bit. Then pour in the rest of your milk. Heat to desired temperature. It’s much easier than these directions look! I like that technique – what a great idea, renee! thanks for sharing!! I bought the trader joe’s peppermint hot chocolate too – I could tell it was chocolate shavings and would have to be good! I haven’t made it yet…because I’ve bought so many treats from trader joe’s lately I can’t keep up!!! 😉 glad to know it’s going to be yummy! Any hot chocolate lover with roots in Utah needs to try the hot chocolate at Hatch’s Family Chocolates in SLC. A-MAZ-ING! I discovered this recently too. It’s hard to go back once you’ve had the real deal! I made hot cocoa using Hershey’s cocoa and the recipe on the box for my husband for part of our Thanksgiving breakfast. It convinced him that he doesn’t need hot cocoa from the coffee shop anymore, we like the slightly bitter flavor. Anyways, we picked up some drinking chocolate from Ghiradelli a few months ago and love it, especially made with some fattier milk than our regular 1%. (Half and half anyone?) I guess we need to just keep good chocolate on hand. I somehow missed your hot chocolate post from last year, maybe I’ll be making some this weekend as an extra gift when I visit my parents. The marshmallows were always the Williams-Sonoma treat I was obsessed with. I’ve never tasted any like them!